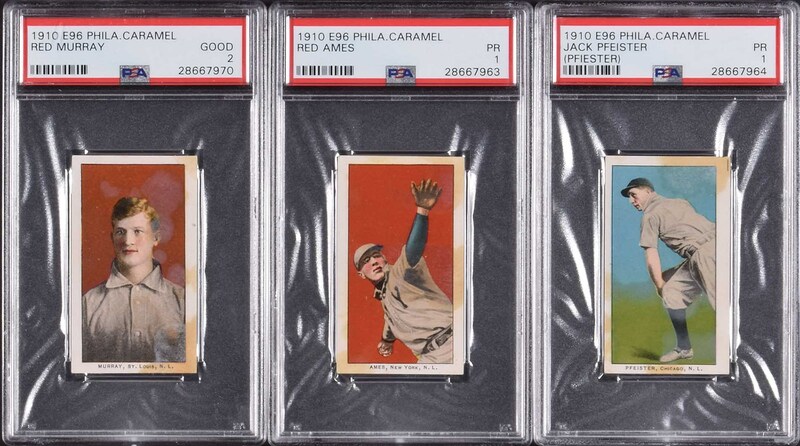 Presented is a very attractive collection of nine E96 Philadelphia Caramel cards including three Hall of Famers. Each card has been graded and encapsulated by PSA. PSA Grading Report: One VG-EX 4: Karger. Three VG 3: Baker (HOF), Lajoie (HOF), and McQuillan. One GOOD 2: Murray. Four PR 1: Ames, Gibson, Mack (HOF), and Pfiester. While many caramel companies were satisfied with producing only a single set, Philadelphia Caramel followed up its twenty-five card 1909 entry with another thirty cards in 1910. The fact that the E96 card set was issued at all suggests that the E95 set had been a marketing success. The Philadelphia Caramel Company obviously made a conscious decision not to duplicate any players in its two card issues. 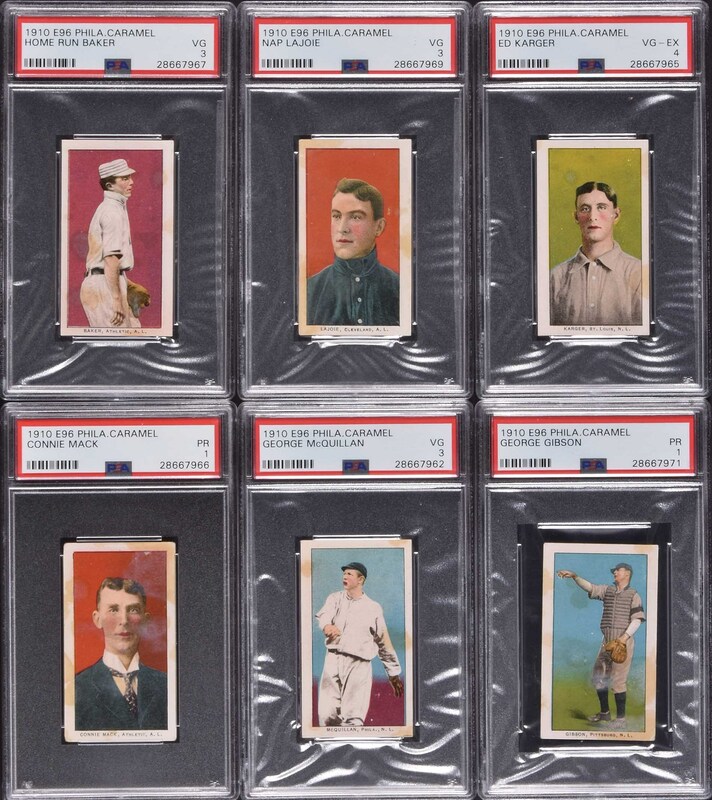 Unfortunately, for collectors, they had already used most of the game's biggest names in the first set, but were able to muster up an additional eight Hall of Famers for this set, including Connie Mack in one of his few card appearances. The cards are very similar in design to their E95 counterparts and can most easily be distinguished by the attractive red-printed checklist of the complete set on the reverse of each card. Almost all of the cards have a far better appearance than suggested by the technically accurate PSA-assigned grades, which are generally the result of minor staining. This is a very attractive collection of caramel cards from one of the era's most popular and classic sets. The SMR value in the assigned grades is $1,660. Total: 9 cards. Reserve $500. Estimate $1,000+.